Miami Colombians find Uribe guilty in mock-trial | Fight Back! 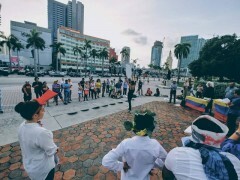 Miami, FL- Around 30 people, largely from the small but well-organized group Progressive Colombians Miami, gathered at the Torch of Friendship in Miami to take part in an international day of action called for by Colombia Humana. The August 7 Day of Action denounced the ongoing right-wing violence in Colombia that is being committed against former guerillas, progressives, human-rights activists, unionists, and farmers by government-supported paramilitaries. Hundreds have died since the supposed peace-deal was signed by now former-president Santos two years ago. The Miami event was one of over 83 that took place in 17 countries across the globe. 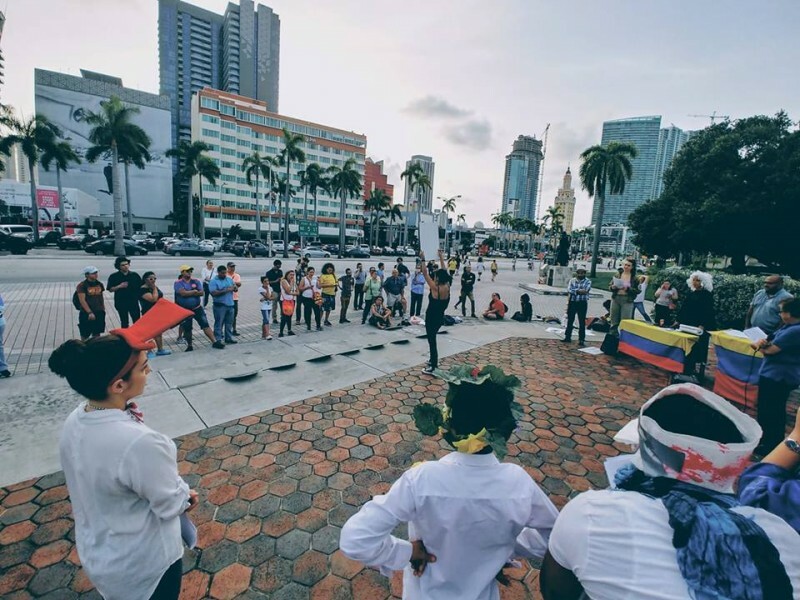 For their part, the Miami activists decided to use the opportunity to inform the public of the atrocities being committed against progressives in Colombia by acting out an original play entitled, El Juicio del Desjuiciado, or The Trial of the Demented. The mock-trial was an original and engaging way to explain the history of Colombia, the reasons behind the ongoing violence there, and why a real peace must be achieved for the people of Colombia and the world.